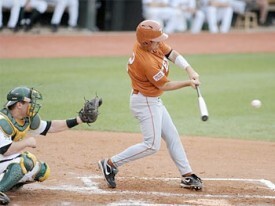 Soon after the Longhorns took the championship trophy off the field in Oklahoma City the Phillips 66 Big 12 Baseball Championship All-Tournament Team was announced. 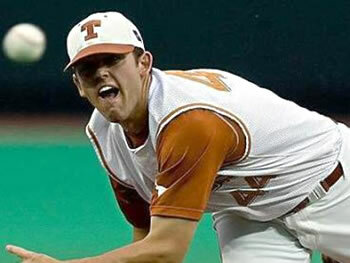 Three Texas players were named to the team and first baseman [tag]Brandon Belt[/tag] was named the tournament’s Most Outstanding Player. Belt hit .588 with two doubles, one home run and 10 RBI in four games. 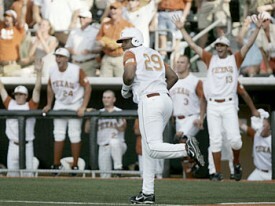 The Texas baseball team blew a big lead against the Sooners in the 7th inning but rallied back in the bottom of the 9th to win it. The win makes the Horns 2-1 in the Big 12 Baseball Championships and they’re now headed to the title game thanks to a Texas A&M win over Missouri. Once up by 5 runs, the Longhorns had to score 3 in the last frame to win 11-10. Shortstop [tag]David Hernandez[/tag] singled up the middle to score [tag]Brandon Belt[/tag] and win the game. Texas starter [tag]Kenn Kasparek[/tag] pitched well before losing it in the 7th. Pitcher [tag]Keith Shinaberry[/tag] got one out in the 9th but was credited with the win. The team will play for the Big 12 title Sunday against either Oklahoma State or Kansas State. The game will be at 1pm on FSN Southwest.